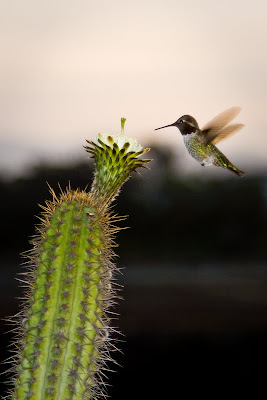 I was shooting a sunrise on the east side of San Diego and this humming bird appeared out of nowhere. You know what they say, "The more prepared I am, the Luckier I get." Perfect composition. I really like the definition in the flower on the top of the cactus. I am drawn downward by the bright spot at the bottom of the cactus--it competes a little bit with the flower at the top. Thanks for sharing this great catch.